We have fetishised the word 'Leader'. You're a leader, I'm a leader, we're all leaders now - rendering the word completely meaningless. What do you do for a living? I’m a ‘leader’. Cue laughter and ridicule. Have you ever heard anyone in an organisation say, “We need to ask out ‘Leader’?” - only if it was sneering sarcasm. The bottom line is that no one in the real word uses the word. It's a bureaucratic construct used only in courses and organisational charts. No person in their right mind would call themselves a leader to someone's face. Describe yourself as my 'Leader' and I'd dismiss you as someone lacking the skills to manage me. In fact, introduce yourself to me as my leader and I'd think you were the opposite.What HR has missed, is that in the real world it's a pejorative term. We need to be far more critical of this terminology and the 'leadership' craze. If you teach this stuff, what exactly have you 'led'? What evidence do you have for the things you are calling 'leadership? It was invented by people who sell management training to fool us all into thinking that it's a noble calling. It’s all a bit phoney, exaggerated but a more worrying proposition is that it may also lead to dysfunctional behaviour? When I first started in the learning world over 30 years ago ‘Leader’ was not a word I heard at all. There was plenty of good management theory and training and most people who headed up companies were called Managing Directors. Then the tech bubble came along in the 90s and we all went gaga for snazzy, new US terms and everyone swapped out the sober and descriptive MD for CEO (Chief Executive Officer) (I’m guilty here). The word ‘Chief’ is an interesting choice. You were no longer someone who ‘managed’ others but the big chief, big cheese, a big shot. It was then that another word was plucked from the shelves of the sweet shop that is faddish HR theory – ‘leader’. Suddenly, managers weren’t people with competences but top dogs who ‘led’ people towards victory. Mike, senior manager in accounts, was now a dog of war. >..... that's the problem right there. Lacking any depth of analysis or solid theory, HR and Learning & Development re-badged any old management theory courses they had lying around into 'Leadership' courses. As long as you knew what the the acronym SWOT meant, you were a leader. To get an idea of how superficial this has become, check out any Twitterchat on Leadership and marvel at the shallowness of the debate. Leadership is, apparently, any old cliche. Using the word 'Leader' creates a sense of us and them. Leaders are the aristocracy in an organisation, everyone else is a working serf or follower. In a sense the word infers that the people you lead and manage are followers. It sets you apart from other people, not a great quality in management. Of course, leadership trainers will tell you that it’s not about creating followers, but in practice this is the effect the word creates and management trainers jump through hoops to reconcile this leader/follower dilemma. 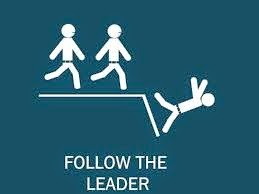 If you want to avoid this problem, simply don’t use the word ‘leader’. When the language changed so did the training. HR bods were suddenly the leading thinkers on leadership. HR and training departments saw an opportunity to big-up their status by breeding, not managers, but leaders. Middle managers went on ‘leadership’ courses run by people who had never led anything, except flipchart workshops, in their entire lives. In practice this meant cobbling together stuff from existing management courses and adding a veneer of specious content from books on leadership. Winging it became a new course design methodology and every management trainer in the land suddenly became a leadership trainer, allowing them to add a few bucks onto their daily rate. Middle managers went crazy for books they’d never dreamt of reading. I’ve seen everything from Meditations by Marcus Aurelius to Lao Tzu’s Art of War touted as serious management texts. I knew it had all gone seriously wrong when I saw a commuter, with a bad suit and combination lock briefcase, on the 7.15 from Brighton to London, reading ‘The Leadership Secrets of Genghis Khan’. What next? Hitler, Stalin… Pol Pot? Managers loved their new found status as little generals, leading the troops. They responded to the training as narcissists respond to flattery, with gusto. I don’t think it’s an accident that this coincided with the megalomaniac behaviour in the banks where ‘leaders’ fed on a high-octane diet of ‘leadership’ training, ‘led’ us into the abyss of financial collapse. These ‘leaders’ adopted delusional strategies based on over-confidence and a lack of reality. There’s a price to pay for believing that you’re destined to ‘lead’ – realism. Managers who now saw themselves as ‘Leaders of the pack’ engaged in behaviours that flowed from the word. They became driven by their own goals and not the goals of the organisation or others. It also led to greater differentials between leader and follower salaries. We have seen leaders in every area of human endeavour succumb to the tyranny of ‘leadership’, in business, politics, newspapers, sport, even the police. Rather than focus on competences and sound management; fuelled by greed, they focused on personal rewards and ‘go for broke’ strategies. So what happened to these ’leaders’? Did they lose their own money? No. Did any go to jail? No. Are they still around? Yes. Have we reflected on whether all of that ‘leadership’ malarkey was right? NO. Let’s get real and go back to realistic learning and realistic titles. 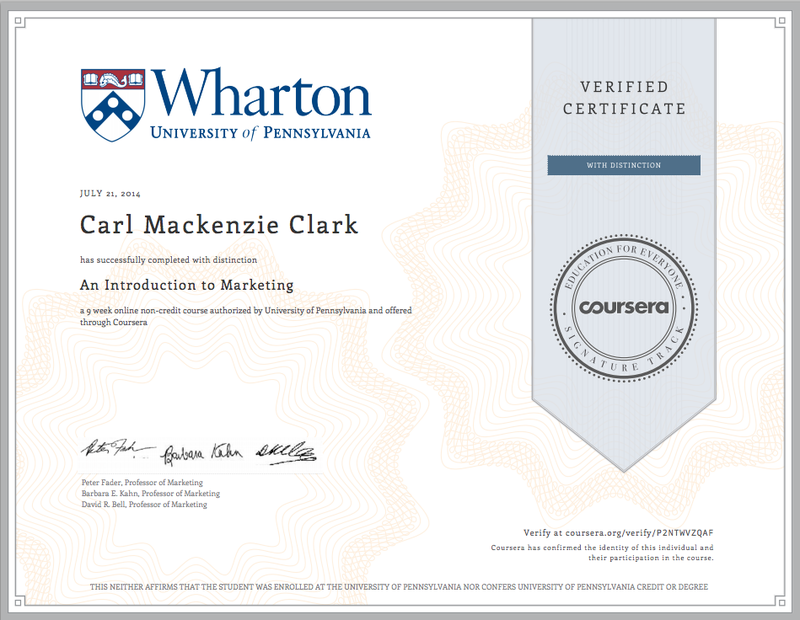 For the last 9 weeks I have been enrolled in a Coursera MOOC ‘An Introduction to Marketing’, run by Wharton at the University of Pennsylvania. Here’s the question; was it worth it and have my marketing skills improved? YES & YES! I have to admit, nine weeks ago, I was skeptical and slightly reluctant to set aside time over nine weeks for this course, as I had looked at others that were not so good and weaker on content. Strangely, the thing that attracted me to this course was the nice certificate at the end that I could link to my LinkedIn profile. To do this I had to sign up for the ‘Signature track’. This cost £30, didn’t break the bank, but gave me a goal, made me care and kept me going. I had a quick look at some of the lectures and was hooked. 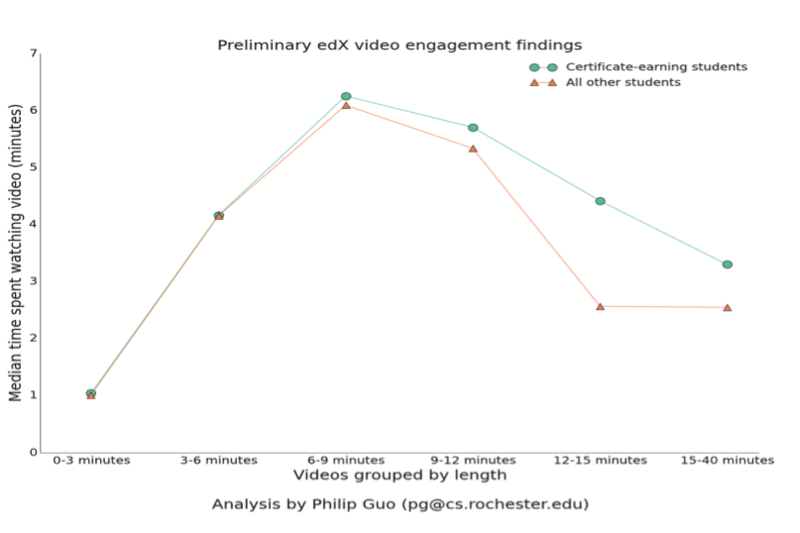 They were not hour-long, boring videos of a dull Prof talking at me, they were 10 minute videos, well made in different consumer locations, with interesting people, explaining things in context. For example, I really appreciated the insights into the difference between product and customer-centric companies. It was this contextual approach that worked for me. I liked this real-world application side as that’s the world in which I have to apply my skills. Every so often, the video would stop and I had to answer a question on what I had just seen, keeping me engaged and not allowing me to simply go with the flow, immersing me in theory until I drowned. The module quizzes also keep you on your marketing toes as it’s easy to just drift along without reflection. I quickly downloaded the app so I could dip in and out when I had a free 10 minutes. That is exactly what I did. Every night, before I went to bed, I watched one quick lecture, at my own pace, until I understood the concepts. This was the perfect amount of learning for me as I have a job, play the drums and all that stuff. Whenever I had a bit of free time, I’d do it – even at 3/4am - that suits me, as when I felt productive, I’d get a load done. I felt in control. The Prof got back to me! I could interact with different students on the forums, reading what they had written from their experiences. I didn’t spend a huge amout of time on the forums but they were interesting. I did ask some questions, to which the professors promptly replied. It was cool to get a reply from the Prof on a question I asked about ‘Celebrity endorsements’. For once learning was a pleasant experience! Tests came frequently and I scored 100% in all of them (honestly!). These really made me focus on the content and commit to remembering what I had learnt. Now I look back on it, I realize that these first tests weren’t trying to trick me , judge me or confuse me (that’s what tests and exams have always felt like), but asking me if I really knew something. If I found it hard, I could flip to the lecture and seal up any gaps. Only the last and longest test was a struggle, asking me more in-depth questions and making me project what I had learnt onto different situations. This was challenging but that’s exactly what I needed, as I was doing this, not as a course, but as a way of improving my marketing skills for my job. Overall, a good MOOC has a good set of people behind it, professors who are clearly excited by the fact they are teaching an unlimited amount of people and are passionate about that. I like the idea that I can shop around, find the MOOC that suits me, and the convenience of doing it when it suited me, usually late at night. Did I like the MOOC? Hell yeah. Did I learn much? Absolutely. Was it useful? My job is in social media marketing and this gave me some depth of understanding on mainstream marketing. Would I do another? Already started. I missed something. My employer encouraged me to take this sort of course and the fact that I can take my certificate (with distinction!) back to him is a big plus. I’ve never had a mentor. I don’t want a mentor. I don’t like mentoring. I know this is swimming against the tide of liberal orthodoxy but I value liberal values more than I value fads, groupthink or orthodoxy. But there’s many reasons why I’m both suspicious of and reject mentoring. 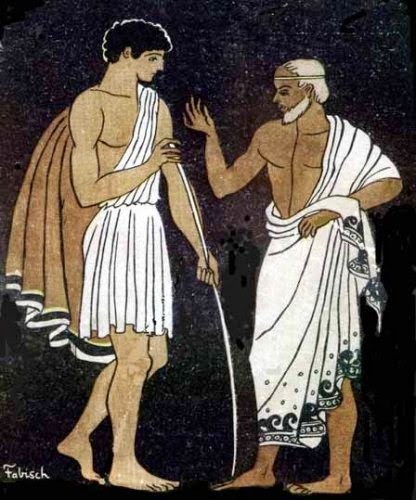 Mentor was a character in Homer’s The Odyssey and it is often assumed that his role was one of a guiding, experienced hand for his son and family. This is false. Mentor was simply an old acquaintance, ill-qualified play a protective role to his family, and worse, turned out to be a patsy for a hidden force, the God Athena. A similar tale has unfolded in recent times, with mentoring being revived on the back of late 19th century psychoanalytic theory, where the original theory has been abandoned but the practice upon which it is based survives. 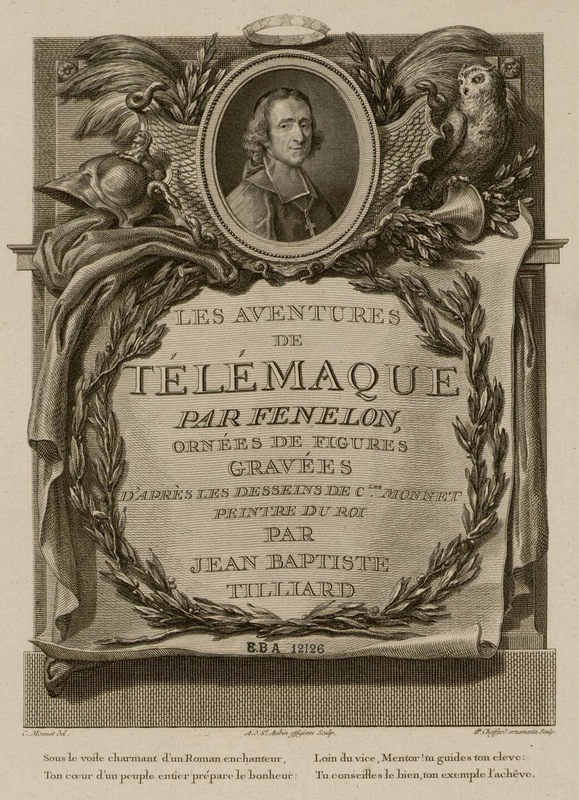 There is another later work of fiction that resurrected the classical model as a source for the word ‘mentor’ in education, Fenelon’s Les Adventures de Telemaque (1699). This is a tale about limiting the excesses of a king but it did reinforce the presence of the word ‘mentor’ in both French, then English. Yet Mentor in this ponderous novel is prone to didactic speeches about how a king should rule (aided by the aristocracy), hardly the egalitarian text one would expect to spark a revolution in education. Interestingly, it pops up again as one of two books given to Emile in the novel of the same name, by Rousseau. Mentoring came out of the psychanalytic movement in education with Freud and Rogers. Nothing survives of Freud’s theories on the mind, education, dreams, humour or anything else for that matter. But Rogers is different. His legacy is more pernicious, like pollution seeping into the water table. His work has resulted in institutional practice that has hung around many decades after the core theories have been abandoned. We need to learn how to abandon practice when the theories are defunct. As Homer actually showed, one person is not enough. To limit your path, in work or life, to one person is to be feeble when it comes to probability. Why choose one person (often that person is chosen for you) when there are lots of good people out there. It stands to reason that a range of advice on a range of diverse topics (surely work and life are diverse) needs a range of expertise. Spread your network, speak to a range and variety of people. Don’t get caught in one person’s spider’s web. Mentoring is a trap. You don’t need a single person, you need advice and expertise. That is to be found in a range of resources. Sure, a range of people can do the job and hey - the best write books. Books are cheap, so buy some of the best and get reading. You can do it where and when you want and they’re written by the world’s best, not just the person who has been chosen in your organisation or a local life coach. And if you yearn for that human face, try video – TED and YouTube – they’re free! I’d take a portion of the training budget and allow people to buy from a wide reading list, arther than institute expensive mentoring programmes. Then there's socil media a rich source of advice and guidance provided daily. This makes people more self-reliant, rather than being infantalised. Little (1990:297) warned us, on mentoring, that, “relative to the amount of pragmatic activity, the volume of empirical enquiry is small [and]... that rhetoric and action have outpaced both conceptual development and empirical warrant.” This, I fear, is not unusual in the learning world. Where such research is conducted the results are disappointing. Mentors are often seen as important learning resources in teacher education and in HE teaching development. Empirical research shows, however, that the potential is rarely realised (Edwards and Protheroe, 2003: 228; Boice, 1992: 107). The results often reveal low level "training" that simply instruct novices on the "correct" way to teach (Handal and Lauvas, 1988: 65; Hart-Landsberg et al., 1992: 31). Much mentoring has been found to be rather shallow and ineffective (Edwards, 1998: 55-56). Practice gets amplified and proliferates through second-rate train the trainer and teacher training courses, pushing orthodoxies long after their sell-by, even retirement, date. Mentoring has become a lazy option and alternative for hard work, effort, real learning and reflection. By all means strive to acquire knowledge, skills and competences, but don’t imagine that any of this will come through mentoring. I know that many of you will feel uncomforted by these arguments but work and life are not playthings. It’s your life and career, so don’t for one minute imagine that the HR department has the solutions you need. Human resources is there to protect organisations from their employees, so is rarely either human or resourceful. Stay away from this stuff if you really want to remain independently human and resourceful. Warhurst R (2003)Learning to lecture Paper presented at the British Educational Research Association Annual Conference, Heriot-Watt University, Edinburgh.